…or how to put the “A” for ARTS into STEM to form STEAM! A quick and inexpensive way to change the appearance of a vehicle by using material that covers the entire vehicle like a giant sticker. The computer designed layout is printed out in full color with all sponsors and names already on it. The material is then applied to the car. On real cars sticky material is used. A new wrap can be applied to modern race cars in a few hours. 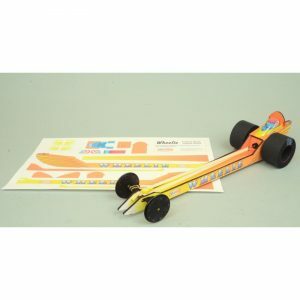 You too can now design your own wrap for our GADD dragsters and bikes as well as some of our propeller driven racers. All you will need is a basic printer. Go to the download a wrap page and look for the “color your own wrap” pdf. You can download that pdf for free and use it to color your wrap using basic software like CorelDraw or similar. Once your design is complete, you simply print the wrap on your printer using standard legal paper. You cut out the parts, apply white glue to the back of the wrap parts and apply the parts to your racer. You can also download and print wraps that have already been colored by us. The download is free. You can also just print out the “color your own” pdf and use markers to color the wrap parts. Try it, it is a lot of fun to create the wraps and the racers come out looking fantastic. Your imagination is the limit! © AeroRacers Inc. All Rights Reserved.